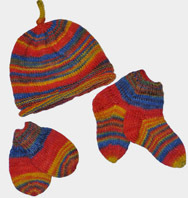 Pattern for baby hat, socks and mitts designed by Sue Morgan in sizes 0-3 months, 3-6 months, 6-12 months. Pattern for stocking stitch baby cardigan designed by Sue Morgan in sizes 0-3 months, 3-6 months and 6-12 months. First 2 sizes use 100g 4ply sock yarn; largest size requires 200g. 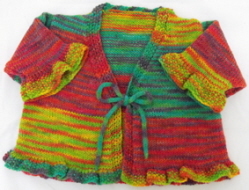 Designed by Frances Fletcher, this easy to knit baby cardigan uses 100gms of 4 ply sock yarn. To fit up to 6 months. The cardigan is knitted in garter stitch and the back and fronts are knitted sideways. 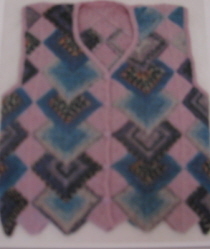 Baby cardigan knitted in mitred squares. The pattern is for 3 sizes - it does not specifiy the finished size but the smallest is for a newborn baby and the next 2 sizes will each be 2.5 cm larger. 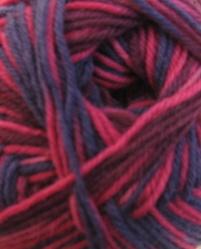 Materials: you will need 100g of sock yarn for the first two sizes and 200g for the larger size. You will also need a pair of 3.00mm knitting needles and 4 buttons. 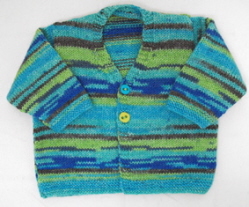 The cardigan is worked entirely in garter stitch and the pattern is for 5 sizes: 0-3, 3-6, 6-12 months and 1-2 & 2-3 years. Materials: you will need 150g of sock yarn for the 1st & 2nd sizes, 200g for the 3rd & 4th sizes and 250g for the largest size. You will also need a pair of 3.00mm needles for the 1st size, 2.75mm needles for all other sizes and 6 buttons. 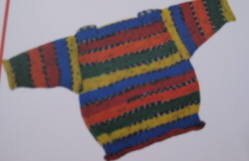 The jumper is knitted in rib and stocking stitch and the pattern is in 3 sizes: 0-3, 6-12 and 12-18 months. Materials: you will need 100g of sock yarn for the 1st size and 200g for the other 2 sizes (this allow for pattern matching if required). You will also need 3.00mm and 3.25mm needles and 6 buttons. 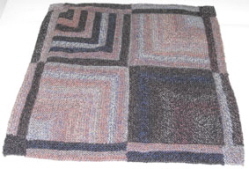 Requires 100gms of self patterning 4ply yarn and 100gms of a contrasting solid colour or knit it using 200g of self-patterning sock yarn for a different look. . 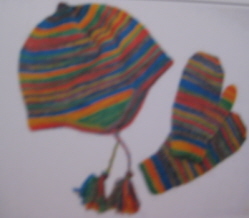 The hat and mittens are knitted flat and the pattern is in 2 sizes: to fit 2-4 and 5-6 years. 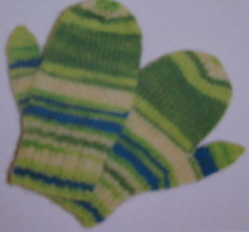 Mittens and fingerless mittens are knitted in the round on double-pointed needles. The pattern is in 5 sizes: 2-3, 4-6, 6-8 years, ladies, mens. Materials: you will need 100g sock yarn (more than one child-size pair can be made from one ball). You will also need a set of 2.50mm double-pointed needles. These fantastic fingerless mitts are designed by Frances Fletcher and are created using mitred squares. You can make 2 pairs from 100g of sock yarn. Designed by Frances Fletcher. Instructions are for 3 sizes - small (5-10 years), medium (10 years to small adult) and large (adult) - and 2 styles (ribbed or stocking stitch). 100g of sock wool is enough for three adult pairs - great for last minute gifts.. Designed by Frances Fletcher, this easy knit adult hat requires 100g of 4 ply sock yarn and 3mm needles. 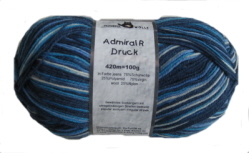 Materials: you will need 200g of multi-colour and 100g of single colour sock yarn. You will also need a pair of 3.00mm needles and 5 buttons. Designed by Frances Fletcher, this lovely cushion covers requires 2 x 100g of 4 ply sock yarn. 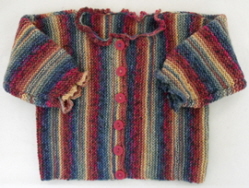 Designed by Sue Morgan, the pattern for this cardigan is in sizes from 0-6 months to 9 years.